The Abbey School retained the Ian Wooldridge Memorial Trophy on a lovely early spring day in March. We make no apologies for publishing the whole of the school report on this fabulous occasion. It shows not only how important the event is to the schools, staff and children, but is also just one example of the legacy our beloved Ian has left behind. 10:30am and the school was buzzing. Nine teams had arrived to compete in the biggest sporting event of the year. The CWSNF Ian Wooldridge Memorial Cup. Captains were leading warm-ups, managers were making last minute preparations, & Mr Jackson was picking up his favourite mug that had been smashed by a wayward ball. Soon after it was time to let the games begin. There was no better way to start than Abbey F.C vs Abbey United. 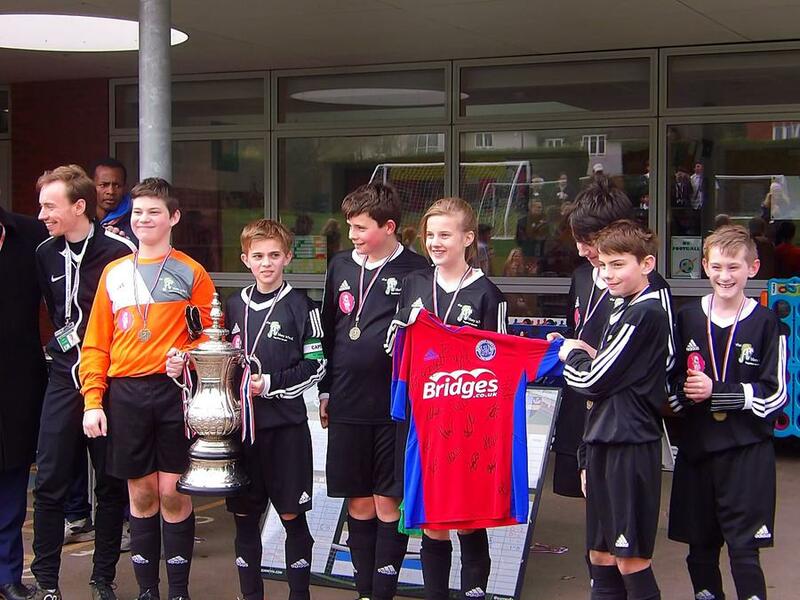 The KS3 team that has won every game since their formation, had to battle against themselves. 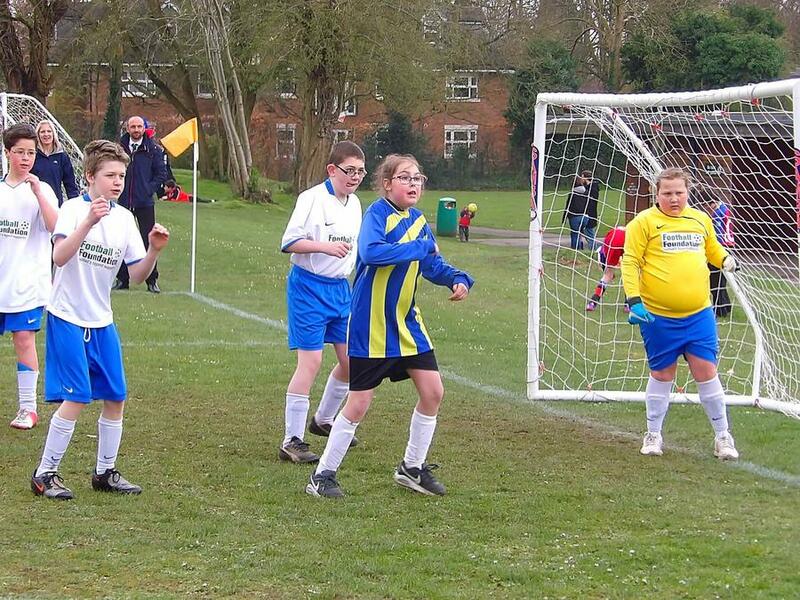 It started off with Abbey United on top, sitting deep but defending well, pressuring their friends into mistakes. This didn't change until halfway through the match, when Jacob Fletcher entered the arena, adding some steely determination. Three goals soon followed for Abbey F.C, the first by JJ, and the other two from Edward, whose first strike was reminiscent of Marco Van Basten's volley from the 1988 Euro final. 3-0 the final score, and a high standard set from both teams for everyone else to follow. The next match was on pitch 2 with Abbey Athletic, a youthful squad with bounds of enthusiasm. They started their campaign with a well-deserved 0-0 draw, earning 2 points. Kaylie was in goal, Connor keeping it tight at the back, Adam bossing the midfield, & Daniel frightening the opposition’s defence; a brilliant start for the debutantes, and for The Abbey School. 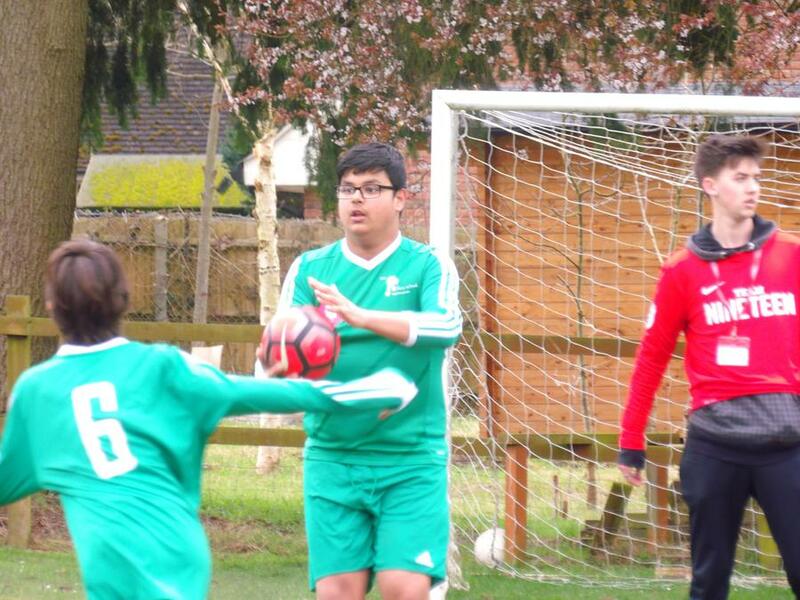 As the group stages went on, Abbey F.C continued to grow into their devastating potential, winning every game, scoring 15 in total and conceding none. 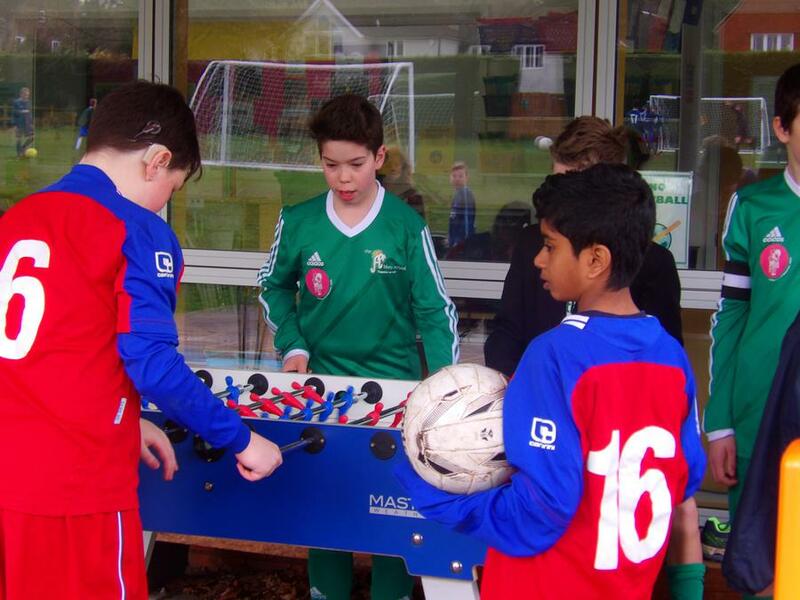 Abbey Athletic fought valiantly against two very experienced and strong opponents in Dove House and The Park. They finished their group with a respectable 4 points, demonstrating to every other team, how to play with a smile on your face, whatever the score line may be. This left Abbey United. With a loss, win, & draw to their name, a win would guarantee them a place in the semi-finals alongside their teammates. Mark, Tarmim & Connor were having a fantastic tournament so far, and stepped it up another gear, playing the best football of their lives. 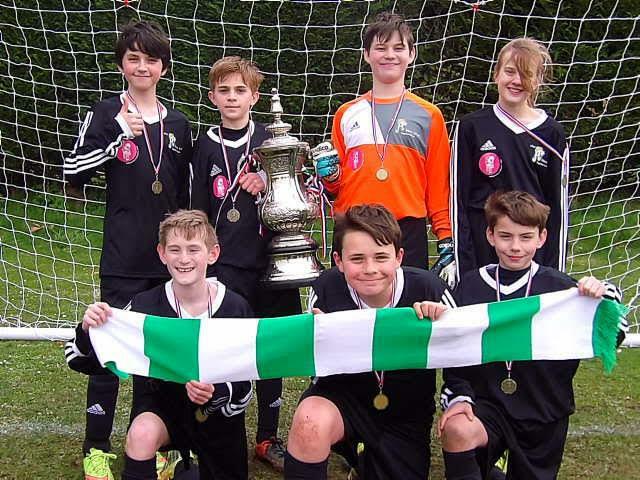 The whole team were working as a solid unit, and got their just rewards when Kieran notched his second of the tournament to send Abbey United through. Quite possibly the greatest sight of the day was during lunchtime. 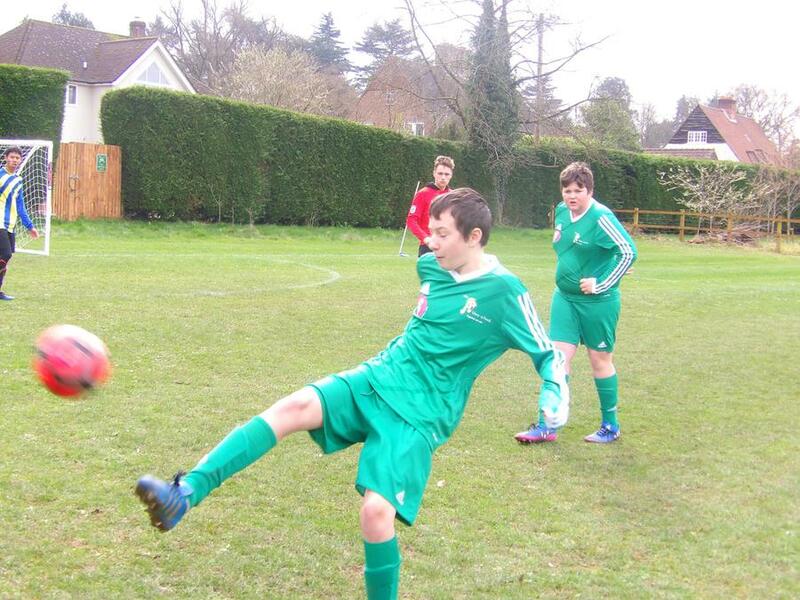 The sun decided to make a cameo appearance as nine competitive teams and referees from Farnham College were eating, playing, and laughing together, without a care in the world. This was the moment when Tom said, "I love days like this, they're my favourite days in school. This is the best day I've had at The Abbey." Unfortunately this peaceful bliss had to end as the second round of fixtures where fast approaching. 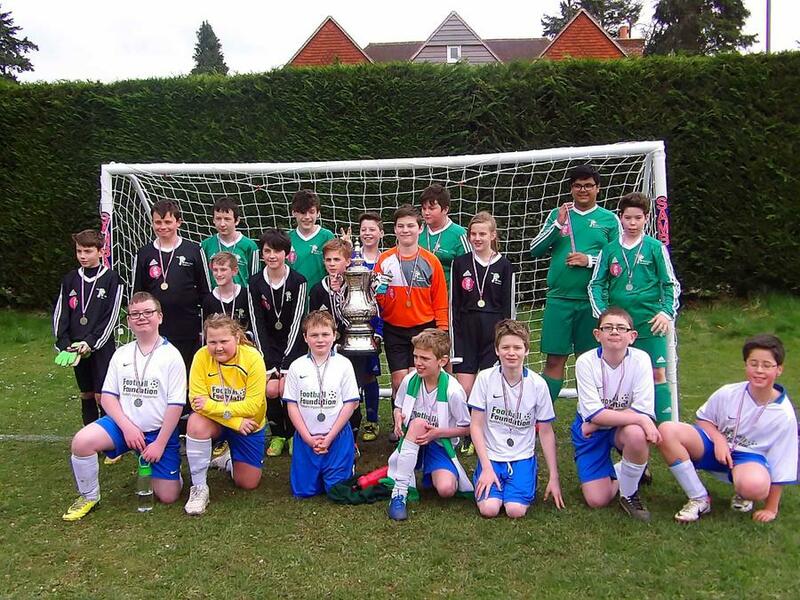 Abbey Athletic were now competing with four other teams, three of which they've never faced. Once again they fought bravely, giving their all. They may have been beaten on the score line, but no one could better the smiles of Irisha, Connor 1, Connor 2, Patrick, & the rest of the squad, whether they were in the middle of a game, or supporting the other two Abbey teams from the side-line; an amazing day for Abbey Athletic, and wonderfully coached by Mrs Visioli. The business end of the tournament had arrived - Semi-finals: Dove House vs Abbey United and The Park vs Abbey F.C. First up was Abbey United. 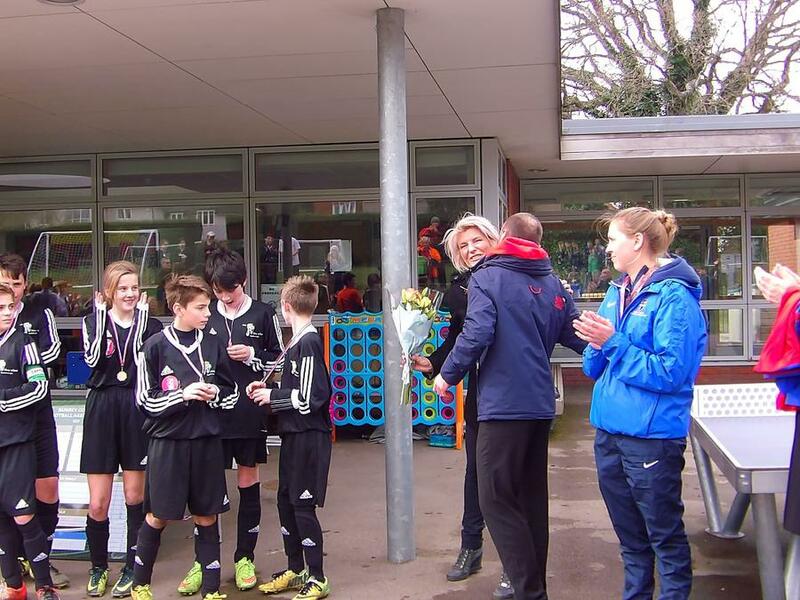 A huge hurdle awaited as they faced a specialist sporting academy, and runners up from last year in Dove House. The game began well for the team in green. Toby battling hard, Bobby putting in a captain's performance at the back, and Jude using his blistering speed to pin back the favourites. However, similarly to their first game, the opponents took the lead, and shortly followed up with another 2 goals. A courageous effort from the boys in green, a 3rd place play-off was waiting. Who was going to face Dove House in the final? 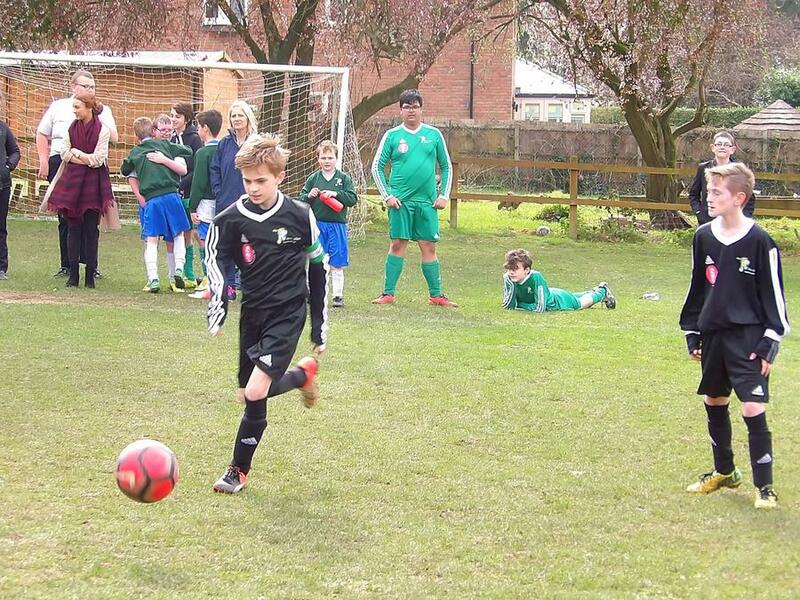 An incredibly close game with Abbey F.C shading possession against their opponents, The Park. Edward scored a superb goal to take the lead after some excellent play on the wing from Will, who was having his best game so far, tormenting his opposite number on the flank. Ben & Zara kept their clean sheet record up as they had a mix of solid and hard defending infused with calmness and composure to send the ball to the forwards. Full-time. 0-1. The final. Dove House vs Abbey F.C. The two titans of special needs football. The favourites for the trophy. Last year’s finalists. The crowd dramatically increased as the school came out to support their own. The cheerleaders were leading chants of encouragement. 'Together We Can'. And it kicked off, both teams going at it with hammer and tongs. JJ & Edward creating magic but unable to find the net. Tom making spectacular save after save, this was going to the wire. With a couple of minutes to go, a trip in the box was adjudged to be a foul. Penalty to Dove House. Schirmer danced around on the line, as penalty taker and goalkeeper had a standoff like no other. The whistle blew, the ball flew, but Tom knew; a great diving save to his right. The crowd erupted, adrenaline was pumping, a huge clearance from Tom followed, and it hit the post of the Dove House goal, rolled on the line and into the keeper’s hands. He returned it with a massive punt, Tom dropped it, it rolled onto the line, somehow, Tom managed to dive back and scramble the ball back into his tight clutch. The whole crowd was in shock. Mr Molloy was calling for calm. The final whistle went. The craziest end to a game imaginable. Somehow it was still 0-0, Mr Molloy gathered his players and calmed them down. Reminding the players to play with their heads and channel their intensity and support from the crowd. "It's there, the match is there, it's this close. If you want it, it's yours." Either side had 3 minutes to settle the game or it was a repeat of last year, a penalty shootout. Abbey F.C came flying out of the blocks, precise team play from the back led to JJ smashing home from close range. Dove House were on the ropes as Abbey pushed forward again. This time JJ held his run and the ball fell to him at the edge of the box. Turn, shot, goal. The crowd were screaming, somehow Mr Molloy's Abbey scarf ended up on the head of a student from St Phillips. Dove House threw everything in attack after that but it wasn't enough. The final whistle went. Abbey F.C had done the impossible. Retaining the trophy whilst winning every game, and conceding no goals. All the teams got together at the end of the day for the presentations. A huge special thank you to all the organisers, from the CWSNF who sponsor the event and supplied the beautiful kits The Abbey teams played in, The F.A, Farnham College, Aldershot F.C, and of course, our very own Mrs Currie and Mr Packham. First up to collect their medals were Abbey Athletic, an incredibly proud moment for everyone at The Abbey as they demonstrated how to approach any challenge with enthusiasm and sportsmanship. 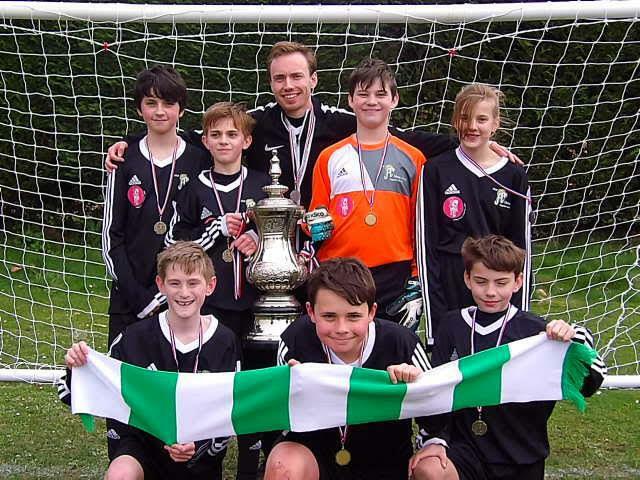 Secondly, Abbey United accepted their 4th place medals; an outstanding tournament by the greens, and an incredible achievement to reach the last four. And finally, up stepped Abbey F.C to reclaim the trophy for another year. 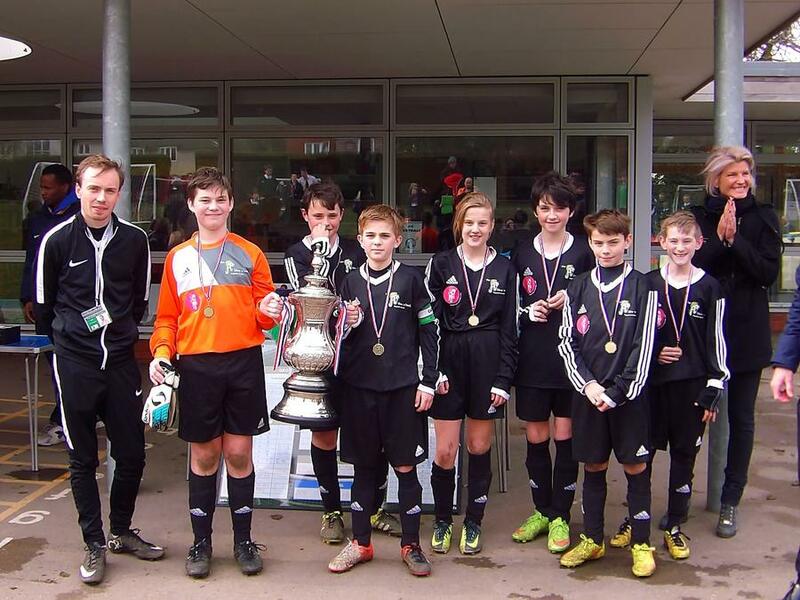 The students decided that the trophy shouldn't just be accepted by Captain Edward, but also Vice captain Tom, for his heroic performance in the final.